Spectacular blooms last from spring until fall! One of the hardiest Crape Myrtles available. Resists mildew, disease and insects. Some of the brightest red blooms of any tree… typically lasting a full 120 days… from spring to fall. Others use them as attractive focal points at the corners of their foundation plantings. Also an exceptional choice to plant in groupings at the corners of your property. 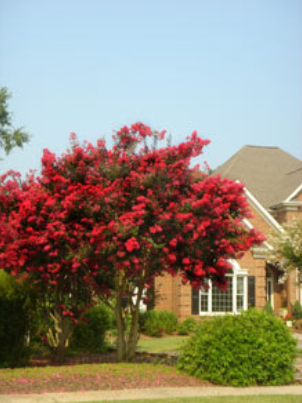 The Dynamite Crape Myrtle Tree can be planted any time of year and we will help you order and plant so your yard can be blooming with color!